Peanut butter lovers, rejoice—there’s a new nut butter on the scene. Meet Justin’s Classic Almond Butter, a delightfully simple spread that will win over even the most devout PB&J fans. An added bonus? It’s naturally gluten-free, vegan, and Paleo-friendly. Whether spread on toast, or drizzled over apple slices, Justin’s Classic Almond Butter is the MVP of snack time. Made from just two ingredients—almonds and sustainably sourced red palm fruit oil—this almond butter is as wholesome as it is delicious. Often, manufacturers try to jazz up nut butters by adding sugar or high fructose corn syrup. Justin’s, on the other hand, is the real deal—this almond butter doesn’t need any sweeteners or fillers to make it palatable. The great taste comes from the naturally delicious almonds. Plus, Paleo eaters or people with peanut allergies can safely enjoy Justin’s almond butter as a peanut butter substitute! Once you try almond butter, you’ll never want to go back to sugary peanut butter again. 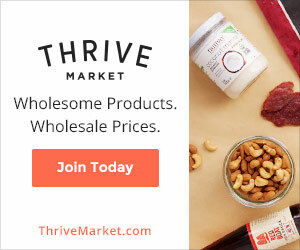 For a limited time, Thrive Market is offering a free jar of Justin’s Classic Almond Butter. Offer ends Wednesday, 6/22/16, at 11:59 p.m. PST.